Oak Island is a 57-hectare (140-acre) island in Lunenburg County on the south shore of Nova Scotia, Canada. The tree-covered island is one of about 360 small islands in Mahone Bay and rises to a maximum of 11 meters (36 feet) above sea level. Located 200 meters (660 feet) from shore and connected to the mainland by a modern causeway, the island is privately owned. Oak Island is noted as the location of the so-called Money Pit and the site of over 200 years of treasure hunting. Repeated excavations have reported layers of apparently man-made artifacts as deep as 31 metres (102 ft), but ended in collapsed excavations and flooding. Critics argue that there is no treasure and that the pit is a natural phenomenon, likely a sinkhole. The Money Pit mystery was the subject of an January 18, 1979, episode of the television series In Search of ... It was also featured on an episode of the television documentary series Northern Mysteries and covered extensively in the Ancient Aliens television series on the History Channel. The History Channel began airing The Curse of Oak Island on January 5, 2014, a documentary series based on a group of modern treasure hunters on the island. The team of modern treasure hunters is led and funded by two brothers, Rick and Marty Lagina, who are the Michigan businessmen who purchased the majority of Oak Island in 2006. In the final episode of the first season of the show, it is revealed that the Laginas' team found a Spanish coin from the 1600s that well predates the timing of the original Money Pit excavation. Canada's The Conspiracy Show aired an episode on the subject on August 8, 2014. "We are saddened by the loss of Dan Blankenship. He will be greatly missed and our thoughts are with his family during this difficult time." If anyone will miss Dan Blankenship, it's the History Channel and A+E Networks for his role in the money-making series about a legendary and real money pit called "The Curse of Oak Island." Dan Blankenship passed away this week at the age of 95 and condolences and tributes to him have been pouring in, including the one above from the History Channel, which produced the popular show in conjunction with A+E Networks. While there was an Oak Island mystery and curse long before him and the show while undoubtedly carry on without him, the story of the alleged hidden riches and secrets of Oak Island will forever be linked to Dan Blankenship. In 1795, 16-year-old Daniel McGinnis discovered a circular depression in a clearing on the southeastern end of the island with an adjacent tree which had a tackle block on one of its overhanging branches. McGinnis, with the help of friends John Smith (in early accounts, Samuel Ball) and Anthony Vaughan, excavated the depression and discovered a layer of flagstones a few feet below. On the pit walls there were visible markings from a pick. As they dug down they discovered layers of logs at about every ten feet (3 m). They abandoned the excavation at 30 feet (10 m). This initial discovery and excavation was first briefly mentioned in print in the Liverpool Transcript in October, 1856. A more complete account followed in the Liverpool Transcript, the Novascotian,British Colonist, and A History Of Lunenburg County (however, the latter account was based on the earlier Liverpool Transcript articles and does not represent an independent source). About eight years after the 1795 dig, according to the original articles and the memories of Vaughan, another company examined what was to become known as the Money Pit. The Onslow Company sailed 300 nautical miles (560 km) from central Nova Scotia near Truro to Oak Island with the goal of recovering what they believed to be secret treasure. They continued the excavation down to approximately 90 feet (27.43 m) and found layers of logs or "marks" about every ten feet (3 m) and layers of charcoal, putty and coconut fibre at 40, 50 and 60 feet (12, 15 and 18 m). According to one of the earliest written accounts, at 80 or 90 feet (27 m), they recovered a large stone bearing an inscription of symbols. Several researchers are said to have attempted to decipher the symbols. One translated them as saying: "forty feet below, two million pounds lie buried." No photographs, drawings, or other images of the stone are known to have been produced prior to its claimed disappearance circa 1912. The symbols currently associated with the "forty feet down..." translation and seen in many books first appeared in True Tales of Buried Treasure, written by explorer and historian Edward Rowe Snow in 1951. In this book he claims he was given this set of symbols by Reverend A.T. Kempton of Cambridge, Massachusetts. Nothing more is known about Kempton's involvement in the Oak Island tale. The pit subsequently flooded up to the 33-foot (10 m) level. Bailing did not reduce the water level, and the excavation was abandoned. Investors formed The Truro Company in 1849, which re-excavated the shaft back down to the 86-foot (26 m) level, where it flooded again. They then drilled into the ground below the bottom of the shaft. According to the nineteenth-century account, the drill or "pod auger" passed through a spruce platform at 98 feet (30 m), a 12-inch head space, 22 inches (560 mm) of what was described as "metal in pieces", 8 inches (200 mm) of oak, another 22 inches (560 mm) of metal, 4 inches (100 mm) of oak, another spruce layer, and finally into clay for 7 feet without striking anything else. The next excavation attempt was made in 1861 by a new company called the Oak Island Association which resulted in the collapse of the bottom of the shaft into either a natural cavern or booby trap underneath. The first fatality during excavations occurred when the boiler of a pumping engine burst. The company gave up when their funds were exhausted in 1864. Further excavations were made in 1866, 1893, 1909, 1931, 1935, 1936, and 1959, none of which were successful. Another fatality occurred in 1887, when a worker fell to his death. (Six people have been killed in accidents during various excavations.) Franklin Roosevelt was part of the Old Gold Salvage group of 1909 and kept up with news and developments for most of his life. In 1928, a New York newspaper printed a feature story about the strange history of the island. Gilbert Hedden, operator of a steel fabricating concern, saw the article and was fascinated by the engineering problems involved in recovering the putative treasure. Hedden collected books and articles on the island and made six trips there. He even ventured to England to converse with Harold Tom Wilkins, the author of Captain Kidd and His Skeleton Island, believing he had found a link between Oak Island and a map in Wilkins' book. Hedden purchased the southeast end of the island. He began digging in the summer of 1935, following excavations by William Chappell in 1931. In 1939, he even informed King George VI of the United Kingdom about developments on Oak Island. The 1931 excavations by William Chappell sank a 163-foot (50 m) shaft 12x14 feet to the southwest of what he believed was the site of the 1897 shaft, close to the original pit. At 127 feet (39 m), a number of artifacts, including an axe, an anchor fluke, and a pick were found. The pick has been identified as a Cornish miner's poll pick. By this time, the entire area around the Money Pit was littered with the debris and refuse of numerous prior excavation attempts, so exactly to whom the pick belonged is unverifiable. Excavation by the Restall family in the early 1960s ended tragically when four men died after being overcome by fumes in a shaft near the beach. In 1965, Robert Dunfield leased the island and, using a 70-ton digging crane with a clam bucket, dug out the pit area to a depth of 134 feet (41 m) and width of 100 feet (30 m). The removed soil was carefully inspected for artifacts. Transportation of the crane to the island required the construction of a causeway (which still exists) from the western end of the island to Crandall's Point on the mainland two hundred metres away. Around 1967, Daniel C. Blankenship and David Tobias formed Triton Alliance, Ltd. and purchased most of the island. In 1971, Triton workers excavated a 235-foot (72 m) shaft supported by a steel caisson to bedrock. According to Blankenship and Tobias, cameras lowered down the shaft into a cave below recorded the presence of some chests, human remains, wooden cribbing and tools; however, the images were unclear, and none of these claims have been independently confirmed. The shaft subsequently collapsed, and the excavation was again abandoned. This shaft was later successfully re-dug to 181 feet (55 m), reaching bedrock; work was halted because of lack of funds and the collapse of the partnership. In the mid 1960s, an account of an excavation of the "Money Pit" appeared in Readers' Digest magazine. 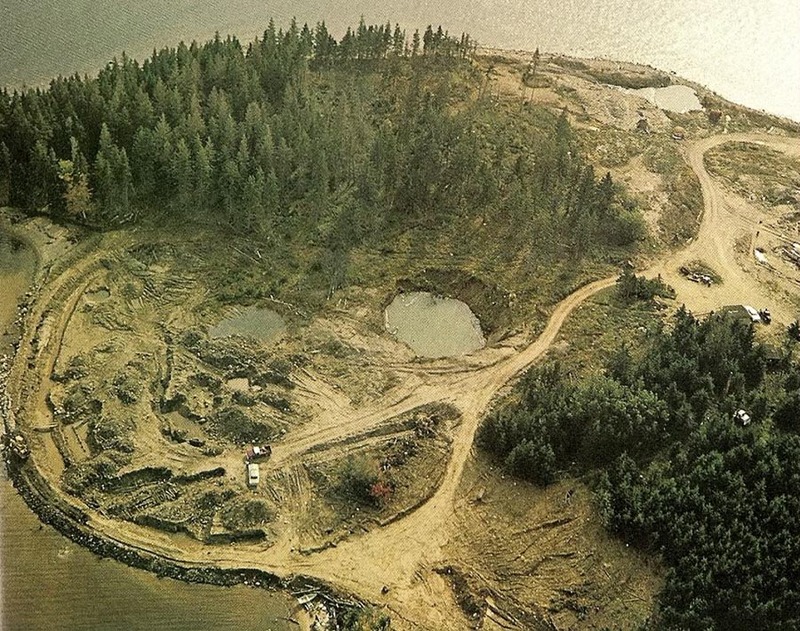 Over a decade later, the Money Pit mystery was the subject of an episode of the television series In Search of..., which first aired January 18, 1979, bringing the legend of Oak Island to a wider audience. During the 1990s, further exploration was stalled because of legal battles between the Triton partners. As of 2005, a portion of the island was for sale for an estimated US$7 million. A group called the Oak Island Tourism Society had hoped the Government of Canada would purchase the island, but a group of American businessmen in the drilling industry did so instead. It was announced in April 2006 that partners from Michigan had purchased a 50% stake in Oak Island Tours Inc., for an undisclosed amount of money. The shares sold to the Michigan partners were previously owned by David Tobias; remaining shares are owned by Blankenship. Center Road Developments, in conjunction with Allan Kostrzewa, a member of the Michigan group, had purchased Lot 25 from David Tobias for a reported $230,000 one year previous to Tobias selling the rest of his share. The Michigan group, working with Blankenship, has said it will resume operations on Oak Island in the hope of discovering buried treasure and the mystery of Oak Island. There has been wide-ranging speculation as to who originally dug the pit and what it might contain. Later accounts claim that oak platforms were discovered every 10 feet, but the earliest accounts simply say that "marks" of some type were found at these places. They also claim there were "tool marks" or pick scrapes on the walls on the money pit and that the dirt was noticeably loose and not as hard packed as the surrounding soil. One expedition claimed to have found the flood tunnel at 90 feet, and that it was lined with flat stones. However, Robert Dunfield (a trained geologist) wrote that he carefully examined the walls of the re-excavated pit and was unable to locate any evidence of this tunnel. The cipher stone, which one researcher is said to have translated to read "Forty feet below two million pounds are buried", was allegedly last seen in the early 20th century (exact dates are a topic of controversy). Some accounts state that Smith used it as a fireback in his fireplace, while others claim it was last seen as a doorstep in a Halifax bookbinder's shop. The accuracy of the translation, whether the symbols as commonly depicted are accurate, or if they meant anything at all, remains disputed. Man-made structures under Oak Island do in fact exist as discussed in many books, including a book written by Lee Lamb, daughter of Robert Restall. Whether these structures are the remains of prior excavation attempts or artifacts left behind by those who allegedly built the Money Pit are unknown. It is known that several documented post-1860 treasure recovery attempts, as described above, ended in collapsed excavations and flooding. Some believe the pit holds a pirate treasure hoard buried by Captain Kidd or possibly Edward Teach (Blackbeard), who claimed he buried his treasure "where none but Satan and myself can find it. Some also hold to the theory that Kidd conspired with Henry Every and Oak Island was used as a pseudo community bank between the two. Others agree it was dug to hold treasure but believe this was done by someone other than pirates, such as Spanish sailors from a wrecked galleon or British troops during the American Revolution. John Godwin argued that, given the apparent size and complexity of the pit, it was likely dug by French army engineers hoping to hide the contents of the treasury of the Fortress of Louisbourg after it fell to the British during the Seven Years' War. There is a story that, like most others regarding the island, lacks adequate archival sources, or any quoted sources at all, which places the priceless jewels of Marie Antoinette (which are historically missing, save for some specimens in the collections of museums worldwide) on Oak Island. During the French Revolution, when the Palace of Versailles was stormed by revolutionaries in 1789, Marie Antoinette instructed her maid or a lady-in-waiting to take her prized possessions and flee. Supposedly, this maid fled to London with such royal items as Antoinette's jewels and perhaps other treasures, such as important artwork or documents, secreted away either on her person (one variation suggests sewn into her underskirts in the case of the jewels, though fails to mention artwork) or as her luggage; it is even said she was perhaps assisted by the remaining officers of the French navy during the uprising at the queen's behest. Still others have speculated that the Oak Island pit was dug to hold treasure much more exotic than gold or silver. In his 1953 book, The Oak Island Enigma: A History and Inquiry Into the Origin of the Money Pit, Penn Leary claimed that English philosopher Francis Bacon used the pit to hide documents proving him to be the author of William Shakespeare's plays, a theory recently used in the Norwegian book Organisten (The Organ Player) by Erlend Loe and Petter Amundsen. It has been asserted that the pit might have been dug by exiled Knights Templar and that it is the last resting place of the Holy Grail. Joe Nickell identifies parallels between the accounts of Oak Island and the allegory of the "Secret Vault" in Freemasonry, similar to the Chase Vault, identifies many prominent excavators as Freemasons, and suggests that the accounts explicitly include Masonic imagery. Did the Sinclair family bring the Holy Grail to the new Word (Nova Scotia) before Christopher Columbus arrived on the American continent? It sounds like a myth to me, and personally I see no relevance to the bloodline story in today's world. The Knights Templar legends had some basis in fact, but the truth about what went on through the millennia will never be known, just as the truth about a man named Jesus will not be known, only told and retold until the end of time. Perhaps no other aspect of history has been more steeped in controversy and distortion than the life, death and teachings of Jesus Christ. The traditional account of Jesus' life and the existence and value of the Holy Grail are both brought into question by The Knights Templar in the New World: How Henry Sinclair Brought the Grail to Acadia. Author William Mann recognizes that for some the romance stories concerning the Holy Grail are nothing more than a quest for physical treasure, while for others they represent a search for inner truth and spiritual awakening. Mann's exploration adds to recent historical theories about the Holy Grail by suggesting that the Scottish Prince Henry Sinclair and the Knights Templar protected the Grail by transporting it to Nova Scotia in 1398. The Holy Grail that Sinclair brought with him, in Mann's view, was not a tangible treasure, but more likely a spiritual pursuit and something quite different - living history related to Christ. 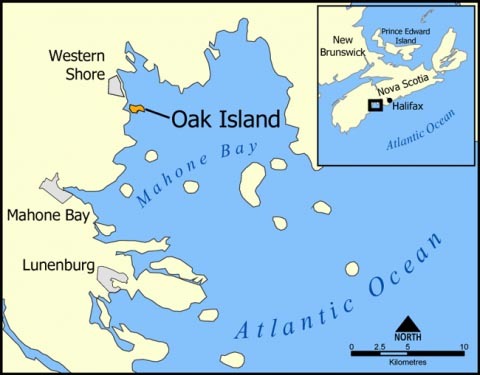 Sinclair's journey to in the New World may have included a visit to Oak Island, one of 300 small islands in the Mahone Bay off the east coast of Nova Scotia. It is a peanut-shaped island merely three-quarters of a mile long and 1,000 feet wide which has drawn much attention for the possible treasure lurking deep within it. Since 1795, disappointed treasure hunters have searched a mysterious hole discovered by three boys. The hole turned out to be a shaft some 150 feet deep that was carefully designed to tantalize and frustrate treasure hunters. Millions of dollars spent in excavation have failed to reveal its secrets, apparently due to intentional obstacles built into the pit, including a flooding tunnel that runs into its side. It is not known when the Money Pit was built, nor by whom. Author William Mann postulates that it was built by the Knights Templar, not to hide a treasure beneath it but to divert attention away from real treasure hidden by Henry Sinclair elsewhere in Nova Scotia. Mann believes the Knights deliberately set it up as distraction, all the while leaving clues to the real location of the Holy Grail, clues that only the initiated might understand, in order to protect secrets the world was not yet ready to receive. Mann's speculation is that the treasure, whatever its precise nature, is located at Green Oaks on mainland Nova Scotia. The clues that he cultivates and culls together are from wide ranging sources and, as he says, no single clue is definitive. It is the conglomeration of clues from such diverse sources as the Gospel of John and Jason and the Golden Fleece, and the application of sacred geometry to maps of Nova Scotia from diverse time periods, as well as to Nicholas Poussin's 1640-42 painting, The Shepherds of Arcadia, that bring Mann to his conclusion. He also says that while standing on a summit in Nova Scotia in 1992, he had an intuitive recognition that the landscape in Nova Scotia had been altered. From these clues and more, Mann builds his case. For every historical theory concerning the Grail, there is a written refutation. So the question of whether Sinclair really visited Nova Scotia nearly 100 years before Columbus is an open one. The evidence Mann points to includes the Zeno Map drawn by two Italian brothers who supposedly sailed with Sinclair. 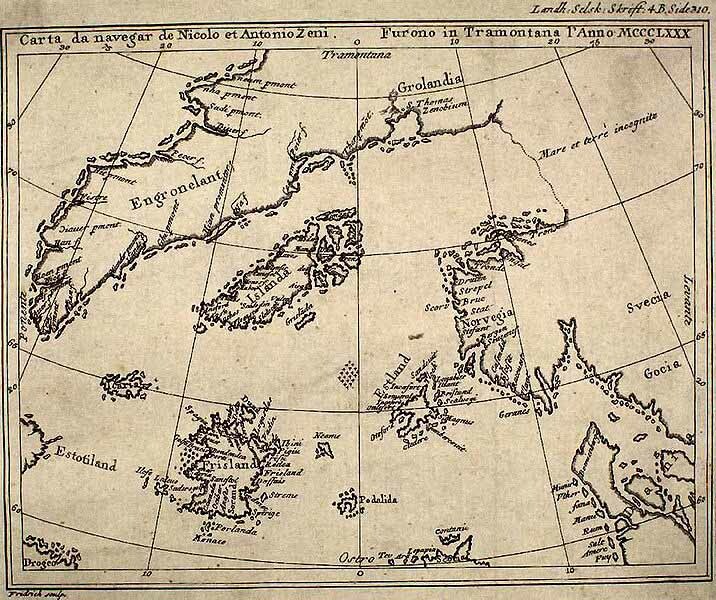 The map is said to be highly accurate, although the names of the islands they visited are not the ones with which we are familiar; Nova Scotia, for example, is referred to on the map as "Estotiland." Similarly, while Sinclair's name is not mentioned, the narrative refers to the leader as Zicchmni, said to be phonetically close to the Latin pronunciation of Sinclair. The Zeno Narrative, the ship's log, appears to describe specific aspects of the trip. Although much of the log is missing and the author of the narrative returned to Europe before Sinclair (Zicchmni), Mann finds within the text a basis to conclude that it refers to Sinclair's trip. Other evidence supporting the possibility that Sinclair visited Nova Scotia includes a 14th century stone carving found in Westford, Massachusetts. The carving depicts a knight with a crest and sword of 14th century design, said to be a memorial to a lifelong friend of Sinclair's who died in battle. In addition, the Mi'kmmaq Indians, natives of Nova Scotia, sing legendary songs of a Glooscap who Mann and others conclude could only be Sinclair. The legends describe voyages, achievements and qualities that Mann believes coincide with some of Sinclair's. Finally, Rosslyn Chapel, built in Scotland by Henry's grandson some 50 years after the voyage, contains among many of its exquisite carvings plants such as cacti and sweet corn. These plants were otherwise unknown in Europe before Columbus' journey in 1492. Rosslyn Chapel also prominently displays a carving of an "engrailed cross" over the west entrance. Rumors persist to this day that the chapel has the Holy Grail secreted within it.